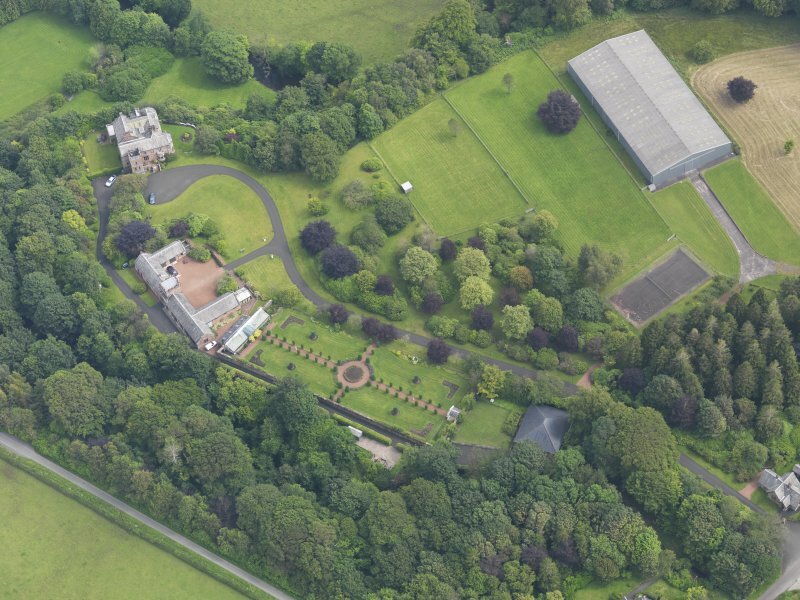 Oblique aerial view of Robgill Tower and policies, taken from the WSW. 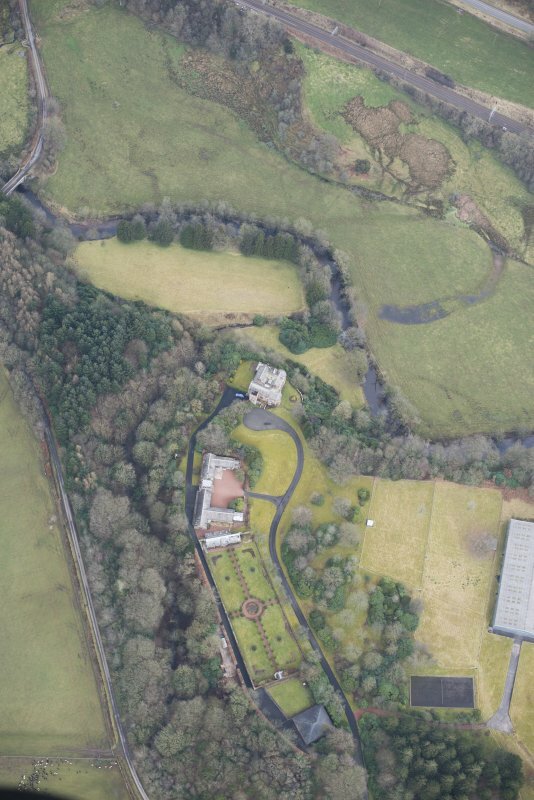 Oblique aerial view of Robgill Tower and policies, taken from the NNW. 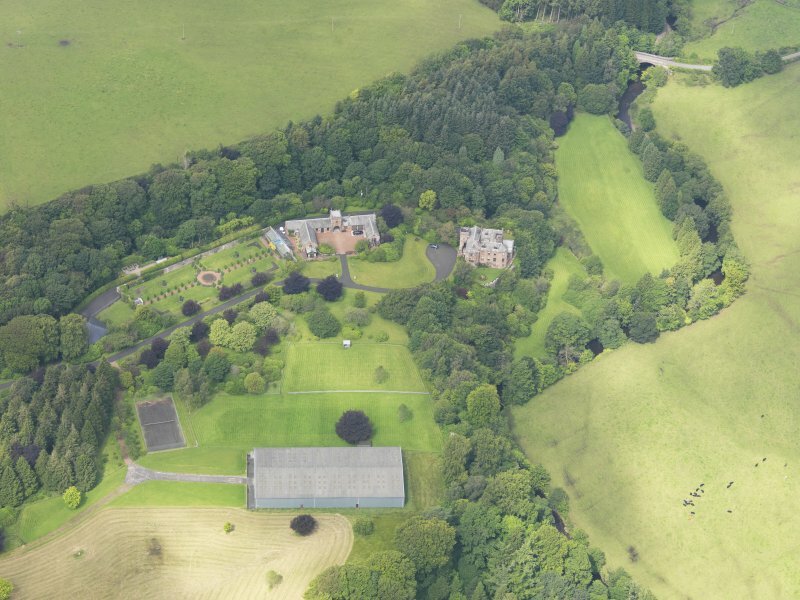 General oblique aerial view of Robgill Tower and policies, taken from the ESE. 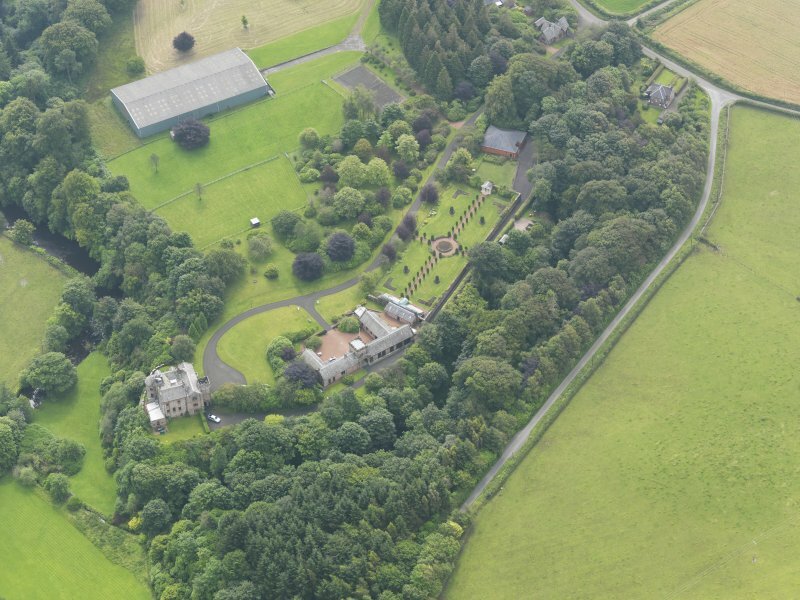 Oblique aerial view of Robgill Tower and policies, taken from the NW. 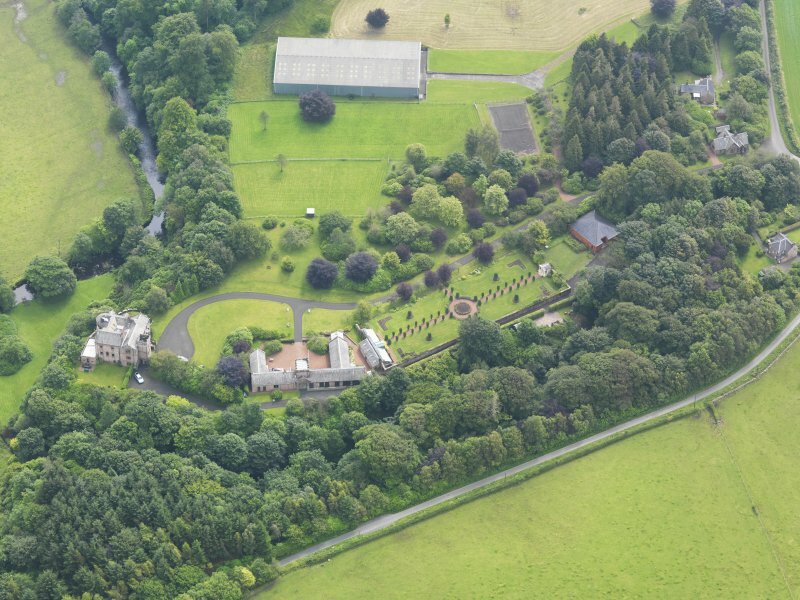 Oblique aerial view of Robgill Tower and Woodhouse Tower, taken from the ENE. 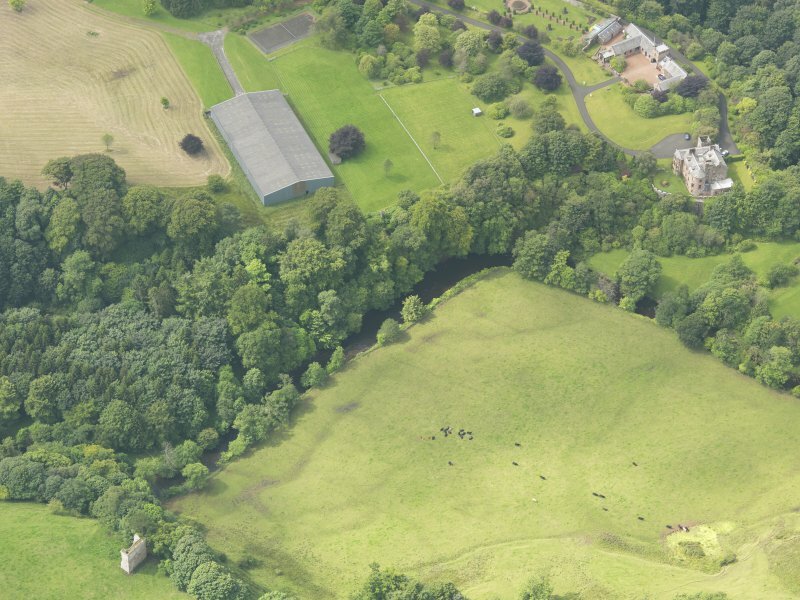 Oblique aerial view of Robgill Tower and policies, taken from the SSE. 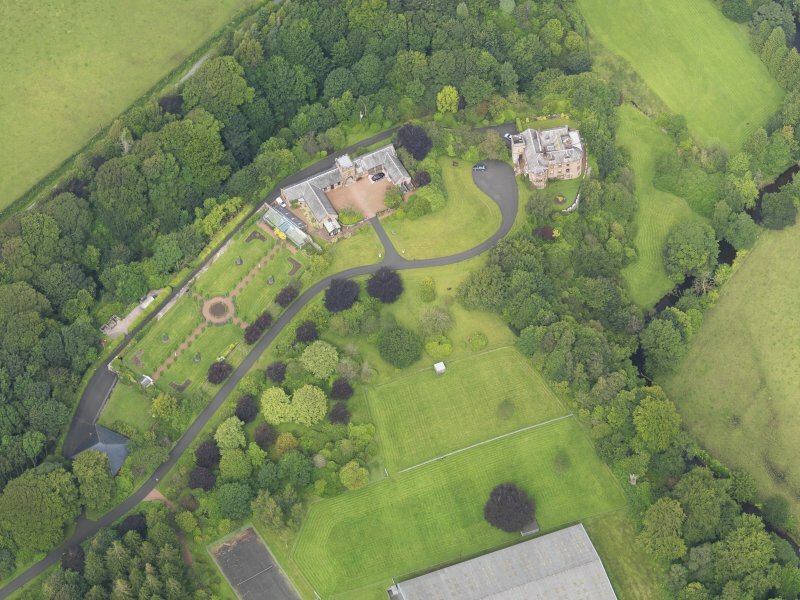 General oblique aerial view of Robgill Tower and policies, taken from the SE. (Tower-house of the Fourth Period). 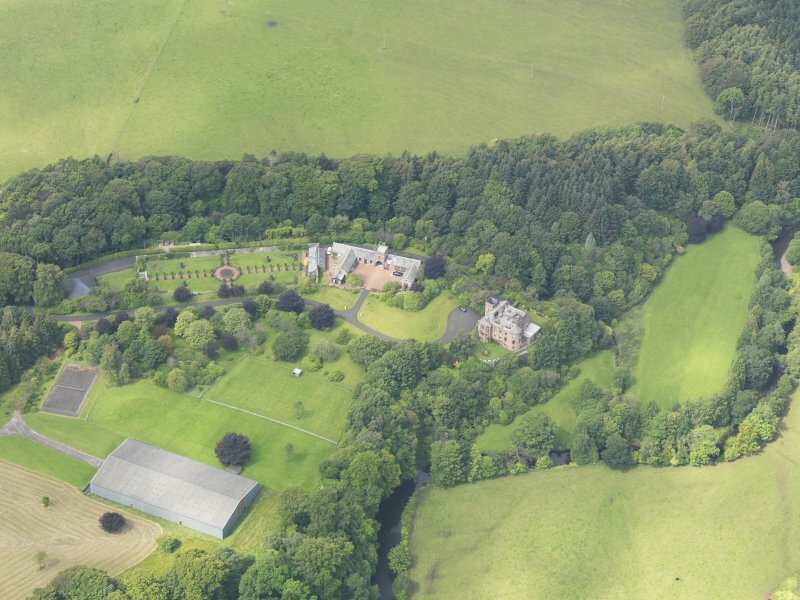 The tower-houses of Bonshaw (NY27SW 6.00), Robgill and Wardhouse/Woodhouse (NY27SE 5) are all situated in the same locality, and within one mile of each other, being in the parish of Annan and from four to five miles distant from the town of that name. They stand in a singularly beautiful valley, through which runs the Kirtle Water. Of the three towers, only Bonshaw is anything like perfect, the other two having had very rough usage. They have all evidently been built about the same time and have many points of resemblance to each other. They are within a few feet of the same size, the average dimensions being about 34 ft (10.4m) by 25 ft (7.6m). Bonshaw is slightly the largest. Bonshaw and Robgill have each a splayed base, and the entrance doorway and staircase are alike in both. The mode in which Robgill was finished at the top cannot now be positively ascertained, but the other two towers were almost identical in the corbelling and parapet, and both have splayed shot-holes and the same small high window on the ground floor. In each case the ground floor only is vaulted. RobgillTower is situated about three-quarters of a mile down the Kirtle Water from Bonshaw, and has a somewhat similar situation on the edge of a cliff about 40 ft (12.2m) high. The tower remained intact until about ten years ago, when it was wilfully pulled down to the level of the hall floor in order to allow of a dining room connected with the adjoining modern house being built over the ancient basemenbt floor. The kitchen was on the ground floor, where the fine arched fireplace still survives. The arch is rounded on the edge and projects some inches from the line of the wall. Originally 34 ft x 24 ft with walls 5 ft thick. In 1912 the only remains were the vaulted basement incorporated into the modern mansion of the same name and used as the kitchen. The tower was burnt by Wharton in 1544. RCAHMS confirmed. No part of the remains is visible externally. Visited by OS (IA) 21 February 1973. This late 16th-century tower, a blue-print for Bonshaw Tower (NY27SW 6) with which it is probably contemporary, stands in an elevated position beside a gorge overlooking the escarpment of the Kirtle Water. Originally three storeys in height, the tower has been incorporated into the NE angle of the present (late 19th century) mansion. Internally, the sole visible features of the tower are confined to ground-floor level. These include (within the basement corridor of the present house) sections of its chamfered plinth, the roll-and-hollow moulded doorway (which has been recently exposed by Mr Shaw, the present owner), a vaulted vestibule with lamp recess, and, suspended from the vault, a pennant bearing an armorial shield and the monogram initials IHS. The vaulted basement (lit by two deeply-splayed windows) has a remodelled, wide-arched kitchen fireplace with a press beside it. The newel-stair opening from the vestibule has been gutted, the stair-well being floored-over at first-floor level. Visited by RCAHMS (IMS), 14 October 1993.